Buy this book at Amazon Books or Powell's Books or your local bookseller. Old MacDonald is building a surprise for the young animals on the farm. With a zztt zztt here, and a tap tap there, the other animals join Old MacDonald in using the many tools in her woodshop. At the end, they surprise the little ones with a miniature toy farm—just like the one where they live! The idea for this story came after seeing the wonderful toys that my stepdad Alan made for my daughters in his woodshop. Trains, cars, doll houses, play stoves…you name it, Alan made it! 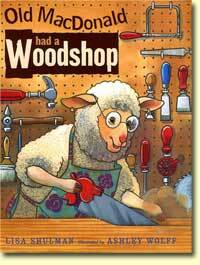 I thought it would be fun to write a book where Old MacDonald builds a toy farm in her woodshop, with her tools making the sound effects. A lot of people like the fact that Old MacDonald is female. When I began working on the book, I suddenly asked myself why we always assume that Old MacDonald has to be a man. I think it’s important for children to have books showing female characters using tools and building things, so I made Old MacDonald a she instead of a he.